Torres del Paine is a national park in the Extreme South region of Patagonian Chile. It is located in the southern tiers of the Andes and features mountains, lakes and glaciers. The Torres del Paine (Spanish for "Towers of Paine", "Paine" being the old indigenous name for the colour blue), three immense rock towers give the park its name. 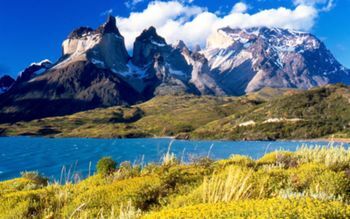 Other attractions include the Cuernos del Paine (Spanish for "Horns of Paine" -- horn-like mountain tops), Grey Glacier, Lago Grey, Lago Pehoe, Lago Nordenskjöld and Lago Sarmiento. The best time to visit the park is between November and April, which coincides with spring and summer in the southern hemisphere. However, be prepared! The weather is fickle and can change dramatically. Daily buses run from Puerto Natales (2 hours), the main connection with civilization. Their itinerary depends on time of year: from November until February there are two buses: at 7.30 AM arriving at 9.30 am at the Laguna Amarga entrance, and in the afternoon at 14.30 pm arriving at 16.30 at the Laguna Amarga entrance. From this point, there are shuttles available to get into Las Torres sector where Base Of Las Torres trek (the most famous one in the park) starts. The price for the bus varies, depending on where you book it, which company you use, etc. As of Dec 2018, companies ask 15,000 CLP for a return ticket, you can try to negotiate. If you entered the park in a different way and you want just a one-way ticket to go back, just board the bus, and you can pay the conductor. The price might vary from minute to minute or from driver to conductor. They ask 8,000 clp (Dec 2018), try to pay a bit less. You will probably not get a ticket anyway, and your money will very "discreetly" go straight into the conductor's back pocket. There are no direct buses for El Calafate, but many tour operators offer them. It is thus possible to go directly from El Calafate to the park and even return another day, although this is expensive (count 80 US$ return, +40 US$ when returning another day). Hitchhiking from/to El Calafate or Puerto Natales is not impossible. Note that most cars come from Puerto Natales. The border crossing at Cancha Carrera is sparsely used outside of the summer. If you have a car, the roads into the park from Puerto Natales are well maintained and fairly straightforward. From Puerto Natales From October to April, several bus companies perform regular daily trip from Puerto Natales to the Park with final destination in the Administration Office, Villa Monzino. The route is via Cerro Castillo. Buses depart from the terminal bus in Puerto Natales, located in Avenida España 01455, telephone 0612410951. Information about routes and fares is available directly from the companies offering transportation of passengers. Return to Puerto Natales: The regular buses from Torres del Paine National Park to Puerto Natales have 2 schedules, and it is possible to take them from three different places of the park, Administration Office, Pudeto and Laguna Amarga Gate. The entrance fee charged at the entrance to this national park is 6000 CLP for Chileans, and 21000 CLP for foreigners. Neither credit cards nor foreign currencies are accepted. Note that if you wish to reenter the park again on a subsequent day, you can ask the personnel to mark your entrance ticket (with a stamp on its reverse) allowing you to use it once more without having to pay again. A catamaran runs between Refugio Pudeto and Refugio Paine Grande taking about 30 minutes. A one-way ticket is CLP 20000, a round-trip ticket costs CLP 30000 (Dec 2018). It is best to board last as your luggage will come out first. The fees are collected during the trip and they also accept USD. Also do not be late for the catamaran as it will leave on time. Another boat service runs between Lago Grey Pier and Refugio Grey, bookings are needed in advance and cost 45000 CLP for a one-way ticket for the 1 hour trip (Jan 2015). With the same company a 3 hour return scenic boat tour can be taken for 55000 CLP (Jan 2015) to see Glacier Grey from the water, with the transfer starting from Hotel Lago Grey. A minivan runs between the Laguna Amarga Conaf office bus stop and Hosteria Las Torres (to connect with buses to Puerto Natales and main walking routes several times a day). The price is CLP 4000 one-way (Dec 2018) for the 20 minute ride (which takes about 90 mins by foot). The rest must be done by foot although there are options by horse (45000 per person from Hosteria Las Torres to Camp Chileno). AFA ([www.argentinaflightadventures.com Argentina Flight Adventures], but also running in Chile) rents and transports tourists on helicopters into and around the park. With the hefty 18,000 peso, or $30 USD entrance fee and the expensive bus ride there, it is best if you are doing a multi-day trek. That said, the design of the park and the lack of frequent buses and ferries within its borders makes anything less than a four-day trek a real hassle. If you go to the park, get your money's worth and hike the "W" for 4-5 days, or do the big circuit. Hike the W Circuit: From west to east: bus to Visitors Centre/Administration, hike via Campamento Las Carretas to Refugio Paine Grande (17.5 km), sleep first night there, hike to Refugio Grey or Campamento Las Guardas (beautiful view of Grey Glacier) and back to Refugio Paine Grande (15 km), sleep at Refugio Paine Grande, hike to Campamento Italiano (7.6 km), sleep there, hike to Campamento Britanico and the Mirador of Vallé Frances (beautiful view on the snow-covered summits) and back (15 km), sleep at Campamento Italiano, hike to Hosteria Las Torres (16.5 km), sleep there, hike to Campamento Torres and Mirador Torres (beautiful view of the three torres) and back (10 km). Minibus to the Laguna Amarga park gate. From east to west is also possible. Hike the Big Circuit: with the connection of the two ends of the W via Campamento los Perros, Refugio Dickson, Campamento Seron. The big circuit does not usually open until November, so if you are planning to trek in late October it may be worth calling ahead to find out. Daytour: Drop off at Administration, Mirador Condor, Salto Grande, Mirador Cuernos, Mirador del Nordenskjold. Catch the bus at Laguna Amarga Gate. Daytour: Drop off at Laguna Amarga Gate, Minibus to Hosteria Las Torres, hike to Campamento Torres and Mirador Torres and back (10 km). Minibus to the Laguna Amarga park gate. Daytour: Drop off at Pudeto, by boat to Refugio Paine Grande, back by boat. Sightseeing tour by boat on lago Grey to the Grey glacier. Daytour: Hike to the Torres, one of the park's star attractions. This is a beautiful and demanding trail through mountains and woods along a raging river. Note that entering the park from the east side will reduce your driving time to the trailhead by about an hour. If using a guide, all equipment, such as tents, sleeping bags, mattresses, crampons for walking on ice and luggage transfers, are all provided by the tour companies. Most companies run longer tours into the Torres del Paine National Park and these are generally between 5 to 7 days' duration.All of them run comprehensive tours with local knowledgeable guides, many of them following the famous "W" circuit, and including a cruise up the Serrano River or along one of the fiords. Depending on the tour, accommodations are provided in tents (either in an organized camp with all facilities, including hot showers, or in the wild with pit latrines), in the park's refugios listed above, or in lodges or remote mountain inns. Other activities offered on guided tours include fly-fishing, kayaking through the fiords and channels, or ice hiking. The ice hiking is near Refugio Grey. Bring as much food as you can or want to carry. The big supermarket in Puerto Natales has a good selection of camping food (though no freezedried meals). There are also a couple of nut/dry fruit shops in town with good selection and reasonable prices. Most refugios and campsites sell some things, but the availability of certain items is unreliable and prices are prohibitively expensive, e.g. a Snickers bar goes for 1500 CLP (3 USD), biscuits are four times more expensive than at the supermarket in town. Some places sell camping gas cartridges at normal prices, but white gas is difficult or impossible to buy. There are several lodgings in the park called "Refugios". Some are basic while others are bigger and nice, with shared areas, fires, small grocery shops etc. If you plan on staying in those, make reservations well in advance. The cost for a dorm bed spot ranges from about 30us$ to over 70us$ with extra costs for bedding / sleeping bags. Vertice Patagonia, ☎ +56 (61) 41-2742 ([email protected]), . For Paine Grande Lodge (was Refugio Pehoe). The website doesn't mention Refugio Lago Grey, but they do handle the reservations for there too since November 2007. Both FantásticoSur and Vertice will ask for credit card information and charge it two weeks before arrival. There appears to be no cancellation penalty before that. There are also several lodges (Explora, Tierra, Awasi, EcoCamp, The Singular, Patagonia Camp) in the region that have included excursions in and around the park like hiking to the base of the towers, the French Valley, Grey Glacier and more. Guided treks/tour in the park can be booked locally in Puerto Natales, or online. There are several campsites. Camping near a refugio costs Ch$4.000 to Ch$8000. There are some free Conaf campsites away from refugios where you may find the pitches very small and on steep ground. All campsites have at least basic toilet facilities (bring your own toilet paper). Despite warnings there seemed no need to book camping spots even in peak season, except for Torres and Chileno which fill up in peak season. In the campings next to a refugio you can rent all the camping equipment required, like a 2 person tent (around 20.000clp, Dec 18), sleeping bag (~10000clp) and matress (~5000clp), stove (5000clp). Please note that the park has rats/mice that come out at night. These critters will chew through your clothing and bags to eat your food! Be sure to put your food somewhere rodents cannot reach overnight. - Hotel/Refugio Las Torres, 8500 CLP (2016. 7500 outside of summer), good showers, some views of the towers. You can store your stuff at the refugio to go hike Valle Ascencio to the towers. - Chileno, 4000 CLP, on the Valle Ascencio trail. Bring extra guy lines because tents pitched on the provided wooden platforms can not be staked down. - Torres, free, basic toilets, you can only camp one night. It is 40 minutes away from the mirador for the towers. Can be reserved several days in advance at Laguna Amarga and Italiano. - Los Cuernos, 8000 CLP (! ), famous for its rude staff and for being really crowded and commercial. Best avoided. Bring extra guy lines because tents pitched on the provided wooden platforms can not be staked down. - Frances,(new) 4000 CLP, - suitable for campers carrying their food. The camping area is a large distance uphill from the bathrooms (which are large and very good quality) and even further from the small building at the bottom of the hill. There was no shelter for campers and no camp cooking area the only shelter was in the building at the bottom of the hill which is extremely small compared to other refugios (8 x 8 meters including staff areas) and cooking there is banned while people staying in the Domes have their meals. Gear hire is possible and meals may be available as they are for Dome stayers however there were not able to serve me as I had not booked. - Italiano, free. They might tell you it is closed but if you show up late (after 6 or 7 pm) the rangers will let you stay. This is the best way to avoid Los Cuernos. Many people do that. In any case, you can use it to leave your backpack to walk up Valle Frances. It is not possible to camp anywhere on the Valle Frances trail. In heavy rains, do not camp near the stream, as rising water can divert and flood your tent. Facilities are very limited (esp toilets) and only one small shelter is provided, you get what you pay for. - Paine Grande, a.k.a. Lago Pehoe, 7000 CLP (December 2015), super crowded, they provide gas stoves for cooking in a cramped cooking area. Very windy. The staff doesn't seem to care much about things. The hot showers are unreliable. If there's still food available after attending guests that stay in rooms, the lodge's large restaurant serves lunch or dinner for 12500 CLP (December 2015). Alternatively, a lunch bag may be ordered. A small bottle of beer costs 3500 CLP and a bottle of non-overwhelming wine is 15000 CLP. There's a small shop selling non-alcoholic beverages and basic food like chocolate, noodles etc. One liter of chocolate milk costs 2500 CLP (3 times as much as in a normal supermarket). - Grey, 6000 CLP. Good facilities, a nice mirador 15 minutes away. The far too small cooking room opens only at 0800 AM and gets extremely crowded and somewhat dangerous (due to gas stoves that tip over) at peak hours, but there are a few tables on the rather sheltered veranda available for cooking if you wish to leave earlier. - Paso, free. Basic facilities. - Los Perros, 4000 CLP. Basic facilities, alike those at a free campsite, but you need to pay for it. - Dickson, 4000 CLP. Fantastic location, can be windy. - El Coiron is just a ranger information station. No camping (unless it is a special case). Camping anywhere outside of these areas will be punished very strictly. Please do not do it! No open fire in the park except in cooking area. CONAF limits the number of people on the O circuit per day (2016: 80). During Peak season campsites are sold out for weeks. Between Refugio Dickson/Los Peros and Paso is the John Gardner Pass (1200m). If bad weather then you have to wait a day. fantasticosur Camp. Seron no yes, req. (03-2019) yes yes no yes no yes, hot after 17h yes ? Vertice Refugio Dickson yes yes, req. (03-2019) yes yes no yes no yes, hot after 16h yes ? ask Ranger Campamento Las Guardas no yes yes no no yes no ? ? ? Vertice Refugio Grey yes yes, req. (03-2019) yes yes no yes no yes yes ? ask Ranger Guard y Centro de Information Lago Pehoe no no no no no yes no ? ? ? fantasticosur Campamento Frances very small no yes no ? yes no ? ? ? CONAF Campamento Italiano no no yes no no outhouse no ? ? ? ask Ranger Campamento Britanico no no yes no no no no ? ? ? fantasticosur Hosteria Las Torres yes no yes yes yes yes no ? ? ? CONAF Camping Las Torres no yes yes no no yes no ? ? ? fantasticosur Camping Centrale yes yes, not req. (03-2019) yes yes yes yes no hot yes ? It can get really cold at night in the park, especially the closer it gets to winter. Sub zero temperatures are common. Bring appropriate camping equipment! Water from streams is drinkable, so you don't need to carry a lot of water. Just walk a bit up the stream to take water (away of the path). Please help keep the water clean! To the north: El Calafate and El Chalten in Argentina and Carretera Austral in Chile. This page was last edited on 16 March 2019, at 01:56.